Crowd on pilgrimage. 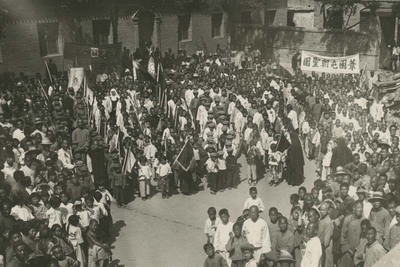 Pilgrims from Weiyuantun (葦園屯), school children, Sisters and Brothers. Crowd on pilgrimage. May 17, 1933. Société des Auxiliaires des Missions (SAM) China Photograph Collection, Whitworth University Library, Spokane.